This past winter, a long weekend away took my wife and me to Edinburgh. The crowds were thin, the weather wet and cold. It mattered not, as history still whispered through the streets and stone walls. We baby-stepped our way through the ‘closes’–the narrow passages that honeycomb Old Town–and fingered the never-ending supply of wool and cashmere products that seem to overwhelm the retail scene. Typical on most tourists’ To Do List would be tasting some whiskey and visiting Edinburgh Castle. For some reason, we did neither. One thing we did do was visit the Writers Museum, which is located in a small building in Old Town. 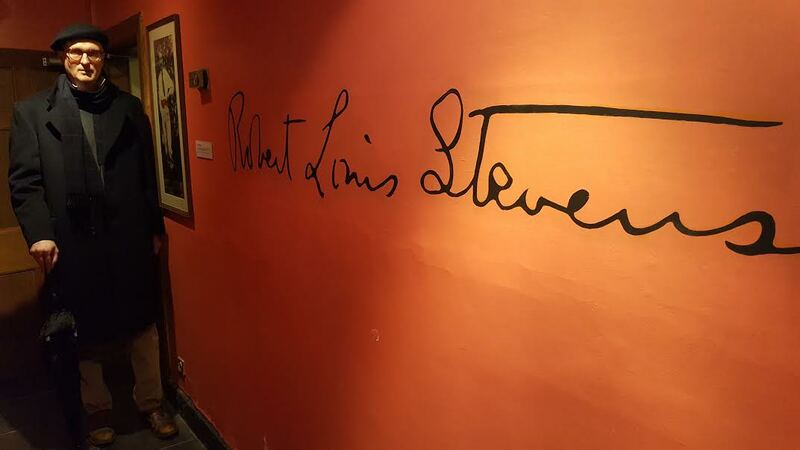 Housing documents, photos, rare books, and personal memorabilia from Robert Burns, Sir Walter Raleigh, and Robert Louis Stevenson, the intimate museum brings the life and works of these three Scottish authors to life. Old Money Guy Robert Louis Stevenson is my favorite. Scion to a family of engineers who built lighthouses, his father had hoped he’d be an attorney. No such luck. Louis was an incurable dilettante. He did, however, learn to apply himself to his writing. His Treasure Island, Kidnapped, and The Strange Case of Dr. Jekyll and Mr. Hyde made him a celebrity in his own lifetime. More importantly, his stories resonate even today. Quite an accomplishment. The museum brought all this to life for me. It was a delightful experience I highly recommend. And you didn’t even make a selfie at the statue of Sherlock Holmes? Well done, Byron. You say “Sir Walter Raleigh”. It should be Walter Scott. Very cool Byron! I love history and Scotland so two of my favorite things in one post. I am just beginning a master’s program in history and hope to work in or around this type of venue after retirement. I am always drawn to the smaller more personable historical sites like the Writers Museum. They are a treasure.